This Saturday, October 6th is “It’s My Park Day”: a city-sponsored event happening from 8AM-12PM at all city parks. Hundreds of volunteers have registered to pick up litter, clear trails, celebrate and beautify Dallas’ parks. However, the City Council may soon vote to allow gas drilling on public park lands for the first time! Dallas has a choice–we can create a world-class park system for future generations to enjoy, or we can create fields of gas wells instead. Click here to send a message to Mayor Rawlings and the City Council now: Don’t frack our parks. This map produced by City of Dallas staff members shows that huge swaths of park lands have been leased to a company (Trinity East) which uses hydraulic fracturing to drill for natural gas. 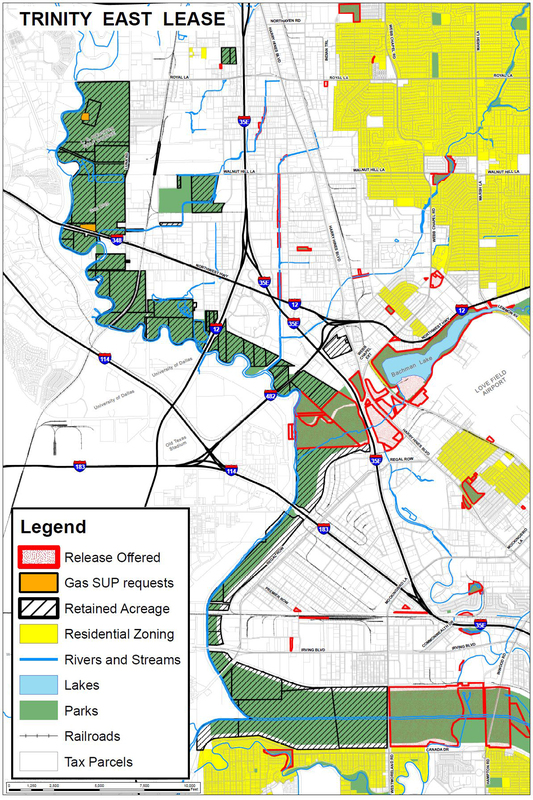 Most of the land is along the Trinity River, and two city parks in northwest Dallas have been leased to the gas company: Crown Park, home to baseball and soccer fields, and the area of the proposed Elm Fork Athletic Complex. The City Council may vote soon on a new ordinance to govern gas drilling operations within Dallas, and one of the most controversial issues facing Mayor Rawlings and the City Council is whether to allow fracking on park lands for the first time. Send you message today: Don’t frack our parks! What about all the possible “private” properties that may be in the process of being leased? The public property leases are much easier to locate in property records. Even if Dallas requires an SUP…the property owners who sign always hold sway ~ even if they have no idea what they’ve signed up for.